TheraTogs are sized by a combination of weight and body dimensions that fit with a specified range. For example, the GFB300 fits pediatric clients (school-aged children) who are between 26 and 45 pounds, and who measure no more than 15” from shoulder to hip (ASIS), and no more than 18.5” from hip to knee. 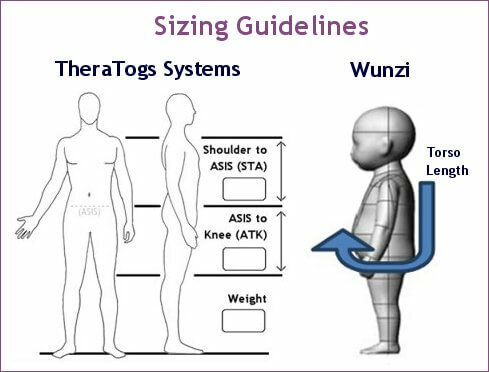 Use our Sizing Chart to choose the correct size for the TheraTogs system you want, based on the weight and bony landmark measurements physically measured on the wearer. Detailed sizing information is provided on each product page also. Products are named and numbered according to their size; for example, all of the Pre-School systems – the PTA, the Full Body System, the Lower Extremity system – are all identified with a 200-series product number: GPTA210, GFB200, and GLE201, respectively. Note: Please do not guess or estimate size. Incorrect sizing is the number one cause of product returns (and restocking fees). Take accurate measurements and use those to select correct product and size for best results. TheraTogs size ranges provide a proper fit for most wearers but on occasion the wearer’s measurements are outside the defined ranges – typically, the ASIS-to-Knee (ATK) measurement is shorter than indicated by the wearer’s weight. Doublecheck your measurements and if necessary you may order a ‘Mixed System’ in which the TankTop garment is one size, and the Hipster garment is another. Place your order for the larger system, and specify that it’s a Mixed System containing the smaller garment. For example, specify a ‘GFB300 Mixed System with 200 Hipster when placing your order. Most of our distributors and providers are familiar with the process, but if you have any questions, please contact Customer Support: info@theratogs.com or (888) 634-0495.